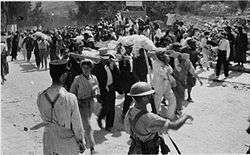 The 1929 Safed riots, during the 1929 Palestine riots, were the portion of the riots in Safed which culminated with the massacre of 18-20 Jewish residents of Safed on August 29, 1929. In 1929, when Mohammed Amin al-Husseini, the Grand Mufti of Jerusalem, told his followers that Jews were preparing to take over the Al-Aqsa Mosque, anti-Jewish riots erupted across Palestine that became known as the 1929 Palestine riots. The Safed riot was part of this wave of violence. Between eighteen and twenty Jews were killed and eighty wounded. The main Jewish street was looted and burned. The members of the Commission of Inquiry visited the town on 1 November 1929. "We set out on Saturday morning. . . I could not believe my eyes. . . I met some of the town's Jewish elders, who fell on my neck weeping bitterly. We went down alleys and steps to the old town. Inside the houses I saw the mutilated and burned bodies of the victims of the massacre, and the burned body of a woman tied to the grille of a window. Going from house to house, I counted ten bodies that had not yet been collected. I saw the destruction and the signs of fire. Even in my grimmest thoughts I had not imagined that this was how I would find Safed where "calm prevailed." The local Jews gave me a detailed description of how the tragedy had started. The pogrom began on the afternoon of Thursday, August 29, and was carried out by Arabs from Safed and from the nearby villages, armed with weapons and tins of kerosene. Advancing on the street of the Sefardi Jews from Kfar Meron and Ein Zeitim, they looted and set fire to houses, urging each other on to continue with the killing. They slaughtered the schoolteacher, Aphriat, together with his wife and mother, and cut the lawyer, Toledano, to pieces with their knives. Bursting into the orphanages, they smashed the children's heads and cut off their hands. I myself saw the victims. Yitshak Mammon, a native of Safed who lived with an Arab family, was murdered with indescribable brutality: he was stabbed again and again, until his body became a bloody sieve, and then he was trampled to death. Throughout the whole pogrom the police did not fire a single shot." 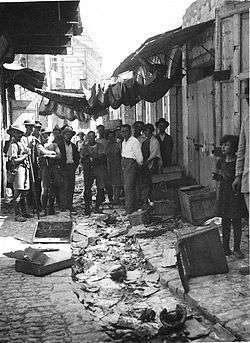 ↑ "Tarpat 1929 Arab Riots in Safed". Zissil. Retrieved 2012-09-15. ↑ Kaplan, Neil (1983) Early Arab-Zionist Negotiation Attempts, 1913-1931. London: Routledge, ISBN 0-7146-3214-7, p. 82. ↑ 'Arab Attack At Safed', The Times, Saturday, August 31, 1929; pg. 10; Issue 45296; col D.
↑ 'The Safed Disorders', The Times, Monday, September 2, 1929; pg. 12; Issue 45297; col D.
↑ 'Palestine Inquiry Commissioners To Visit Safed', The Times, Saturday, November 2, 1929; pg. 11; Issue 45350; col E.
↑ David Hacohen (1 Jun 1985). Time to Tell: An Israeli Life, 1898-1984. Associated University Presses. pp. 37, 38. Retrieved April 16, 2012.